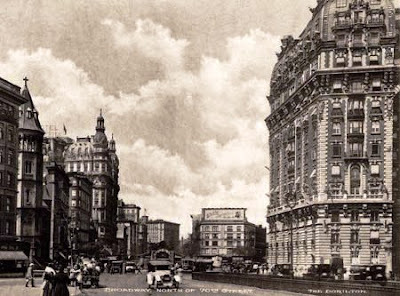 The Boulevard, as Broadway was called in the early days of the 20th Century, promised great things to come. William Stoke’s elaborate Beaux Arts Ansonia apartment building was under construction at 73rd Street on the wide, spacious boulevard that evoked, at least in Stokes’ mind, the Champs Elysees of Paris. Developer Hamilton M. Weed jumped on the French-inspired bandwagon, commissioning architects Elisha Harris Janes and Richard Leopold Leo to design a Beaux Arts concoction two blocks to the south at 71st Street. 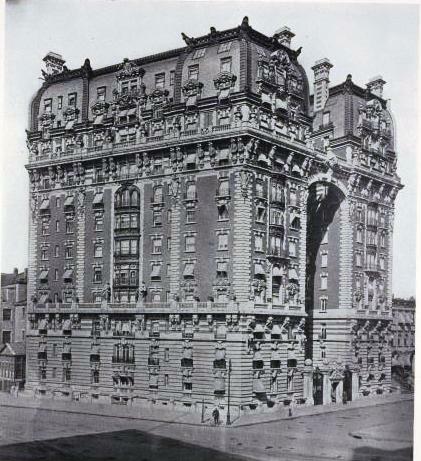 When completed in 1902, the Dorilton was an explosion of ornamentation. 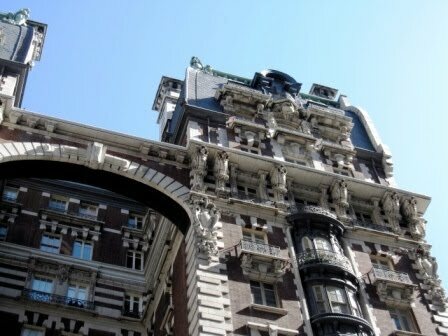 It immediately drew the wrath of architectural critics for its overblown decoration. Well-to-do apartment hunters were not swayed. Weed’s lavish building, which cost him $750,000, was quickly filled with socially-recognized names. 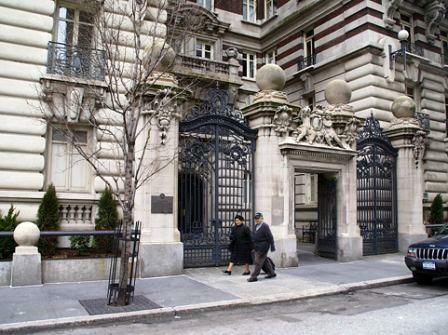 Millionaire Emil Wolff lived here until his death in 1918, leaving over $2 million to Jewish religious and educational charities. The Dolimar had separate elevators for tenants and servants, French paneled rooms, filtered water and a facility to recharge tenants’ electric motorcars. But most of all, it had exterior flamboyance. In 1984 the Dorilton was converted to a co-op. A year later residents began restoration efforts. More than a decade later the renovations continued: the mansard roof was reslated, missing dormers and cresting were reproduced and a $1.5 million restoration of the roof was undertaken, headed by engineer, Robert Feuer. Interestingly, the missing 11th floor cornice was reproduced in trompe l’oeil – the empty wall painted by John Williams and John Wright Stephens to imitate the original. In the sleek glass and steel environment of New York today, a little over-the-top, sugary ornamentation is a welcomed break. 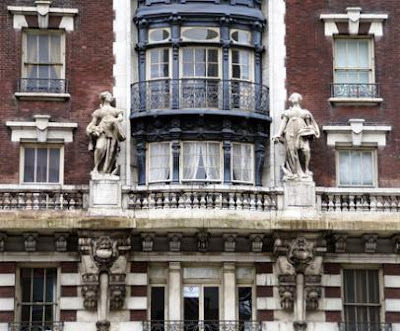 "It immediately drew the wrath of architectural critics for its overblown decoration." Anyone could just imagine. But still, the Dolimar in 1902 was a sight to behold, up until now that it's restored. The marvels that are the elaborate ornamentation, the steel gates, and the metal art around it never fail to evoke feelings from passers-by. It is interesting how many times this happens; contemporary critics pan the design then decades later we appreciate what the architect was striving for. You're absolutely right. How very nice to read about this crazy building. Emil Wolff was an emigrated member of my family, I can imagine that the style of the Dolimar attracted him as he was a merchant of lace and embroidery! I will probably feel pretty dumb when you answer this but I can live with that! 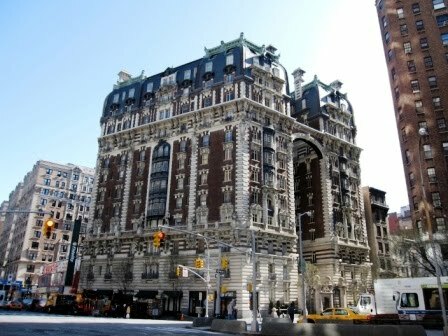 Was The Dorilton called The Dolimar at one time? You use both in the blog. Early photographs are tagged "the Dolimar;" however the name Dorilton is the name that quickly was used. Those were possibly early typos and I can find no official documentation.